Have you heard the news? We’re bringing back fifteen classic designs from Tatty Devine history as a limited edition collection and we need your help to decide the all important 15th piece. We’ve narrowed it down to five of Rosie, Harriet and Team Tatty’s favourite pieces, but it’s up to you to choose which one you think should come back. Join Team Tatty as we delve in the back stories, discover the design inspirations and state the case for each piece up for the vote. Today's pick: the Boat Brooch! In 2012, we recreated a sailing boat in miniature, complete with billowing hand curved red Perspex sails and cute silver anchor. Did you know: this brooch was a playful update of a classic Tatty Devine piece from all the way back in 2006. 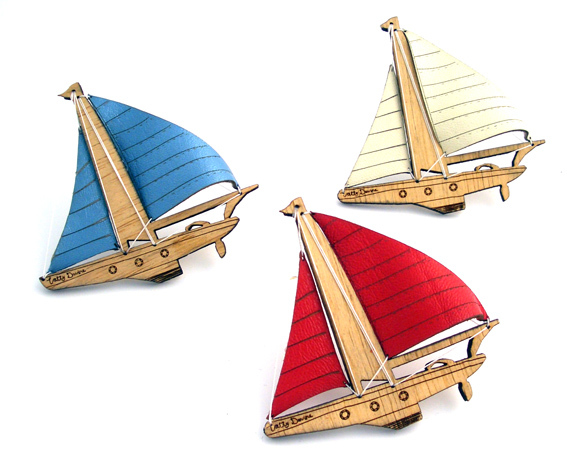 Part of a nautical inspired collection, we launched our very first Boat Brooch in birch wood and red, white and blue leather. Here's a photo of the full fleet - aren't they cute? Harriet says, "I love a nautical theme. There are lots and lots of photos of me over the past fifteen years wearing a stripy Breton top! The Sailing Boat Brooch will always have a special place in our hearts. The original wooden version appeared back in Spring Summer 2006, alongside anchor, pirate flags and ships wheels. My dad is a sailor and I made him try to work out the lashing to put an eye in the end of the miniature rope! We couldn't resist coming back to it in 2012 in honour of the Olympics and reworking it in Perspex. The updated Boat Brooch was inspired by those vintage plastic brooches you find in ice cream tubs at car boot fairs. It's a nostalgic nod to those old cream and blue bakelite brooches, the kind where the paints comes off on your hands but you can't help but love them anyway!" 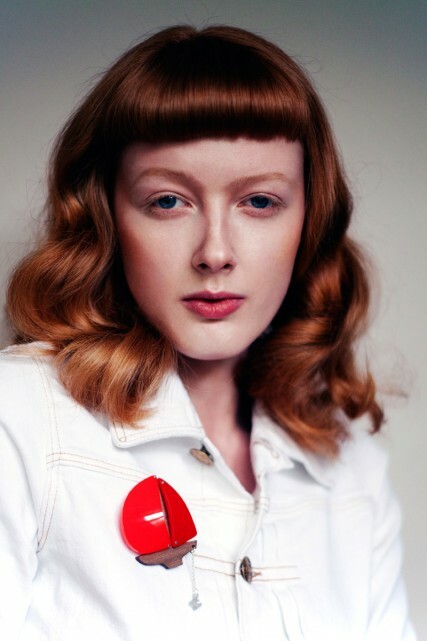 We headed back into the Tatty Devine archives and hunted down the original photo shoot of the Boat Brooch. We still love that white denim jacket... Team Tatty says: Kent studio star Kristy: "My vote is for the Boat Brooch. I love the little anchor charm and the blue colour way helped outfits look really bright and summery." Rosie: "I love the Boat Brooch and have it in red. I wear it a lot, especially on white or navy for the full-on nautical look. I would love to see it return as it is always commented upon and people always look so disappointed when I say it's no longer available." Kent studio star Stacey: "I vote for the Boat Brooch because I would like to live by the sea!" Customer Care star Chloe: "It's good enough to sail away in! I love that it's 3D and the sails are beautifully curved." Kent studio star Sophie: "The Boat Brooch is a favourite of mine. It has a really nautical feel to it. Wear on a trip to the seaside or to add a little bit of fun to an outfit in the evening." 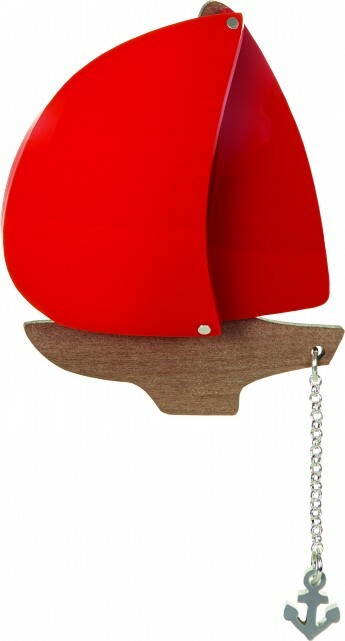 Selfridges store star Susanna: "I would like to see the return of the red Boat Brooch! It has a little anchor and it would make me look like a sailor! Boat, anchor and sailor, 3 great things! Bring back the red boat, please." Kent studio star Caroline: "It would be great to see the Boat Brooch again." Kent studio star Jen: "It reminds me of being on several slightly rocky boats (like the one below!) 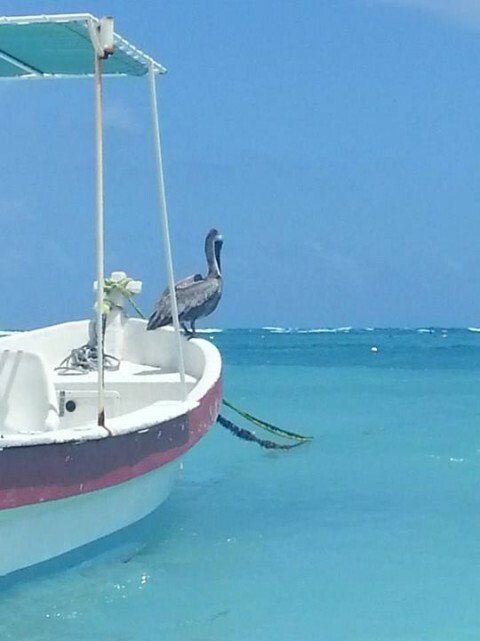 when I was travelling in Mexico earlier this year so I'd love to be able to buy it to remind myself of the joy of holidays and setting sail - plus it has a cute little anchor on a chain!" Fallen for the Boat Brooch? Simply head over to our Facebook album and cast your vote by liking your favourite piece. The most popular piece will launch in store and online as part of our 15th birthday collection, and one lucky voter will win the chosen piece for their collection. Yes, really! Hurry, you only have until midnight on Sunday 13th July to have your say. Get involved and champion the Boat Brooch on Twitter and Instagram with the hashtag #TDBringItBack now!